Gelato Village, Leicester - Sugar, Darling? You know, really exciting things are happening in my home city of Leicester and it's just wonderful. After the crash the high streets seemed to become the soulless home to chain store after chain store and I found it oh so depressing. 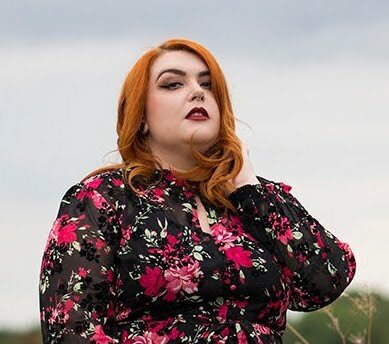 I'm so so pleased that I can walk through Leicester now and visit little indy shops, restaurants and cafes - it feels wonderful to support local creatives and entrepreneurs, help boost the local economy and know that I'm contributing to my community. One of my absolute favourite places in Leicester is now St Martins Square, home to lots of lovely independent shops, cafes, bars and restaurants. Walking through St Martins feels like you've stumbled upon a wonderful hidden artist's area of Milan or Rome and that feeling is heightened when you look into the sparkling interior of Gelato Village a beautiful cafe serving gelato, sorbetto, Italian pastries and much more. A few weeks ago I headed to Gelato Village and spent a fabulously enjoyable morning with Antonio and Daniele, the owners of the cafe, learning all about their passion for creating all natural, artisinal gelato, supporting local business and sourcing local, top quality ingredients. It may seem a little odd to want to open a gelato shop here in Leicester, not only because we associate chilled treats like gelato with summer time of which we seem to get very little, but after just a few minutes conversation with Antonio and you can't help but be infected with his enthusiasm and attitude that gelato is a treat for any time of the year, it's something to bring joy and a ray of sunshine to even the grey-est of days. After visiting myself I would challenge anyone to try a spoonful of their strawberry sorbetto and not instantly be transported to a steaming hot summers day in the countryside! It was Antonio, a former nurse, who noticed something missing from this part of the world on a trip back to see his family in Italy a few years ago that set the Gelato Village cogs in motion - he realised that whenever he goes home to Turin one of the first things he has to do is have a pizza and a gelato. Now the UK is pretty well served for pizzas (albeit possibly not to the standard that Antonio knows back home) but one thing we don't really do here is that wonderful continental thing of having little cafes serving wonderful coffee and delicious sweet treats, open until late in the evening so you can stop by for a little bit of indulgence be it in the day, on your way home from work or after a meal in town. We also tend to think of iced desserts as a treat for holidays or after dinner rather than a little pick me up at any time of day - we'll stop for afternoon tea and cake so why not stop for coffee and gelato? Antonio spotted this little gap and knew he wanted to fill it with deliciousness, so he headed to Bologne and spent two weeks at the Gelato University learning all about this wonderful dessert. Erm, sign me up please!!! Antonio enlisted the help of Daniele and the plans for Gelato Village started coming together. Of course it wasn't without some fears, especially when work on the cafe was fully underway and the two men left their jobs to follow their dream. Would it be appreciated? Would they be able to source ingredients of a good enough quality? Could they find the right people to form a trusted team that they could train to the highest standard? But like most fears, with hard work and dedication their dream was realised and they haven't looked back with the celebrations of Valentines Day and the re-burial of King Richard III putting them deservedly on the map! That isn't to say there weren't tough times - delays meant that the store couldn't open until the end of the Summer season and finding a local dairy to buy milk from turned out to be a bigger mission than they had anticipated. Thankfully their hunt led them to Belvoir Ridge Creamery based in Melton Mowbray, famed for bringing back the delicious Colwick cheese. 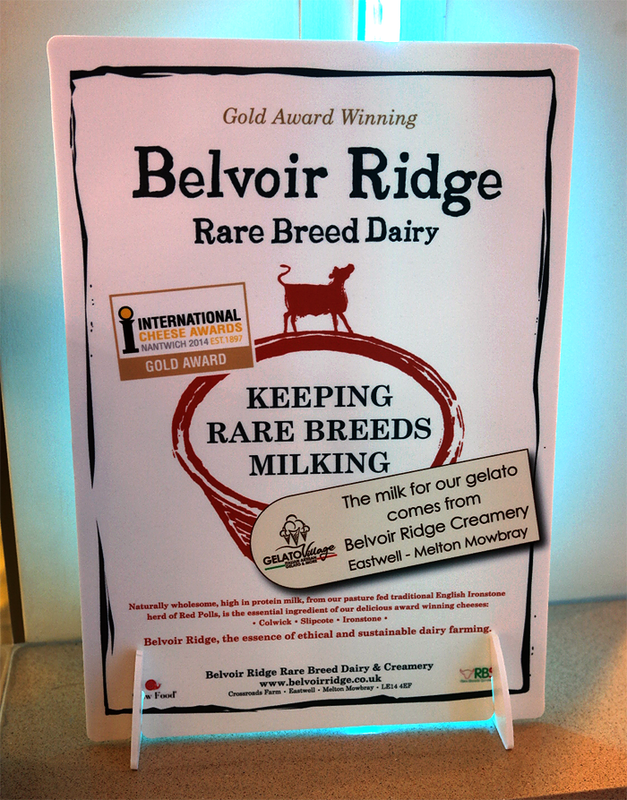 The milk from Belvoir Ridge comes from their heard of Red Poll cattle and is unusual in that it is pasteurised but not homogenised like the vast majority of milks available in the UK. This means that there are no extra processes that the milk goes through to break down the fat molecules, making it the perfect milk for making cheeses... and gelato! 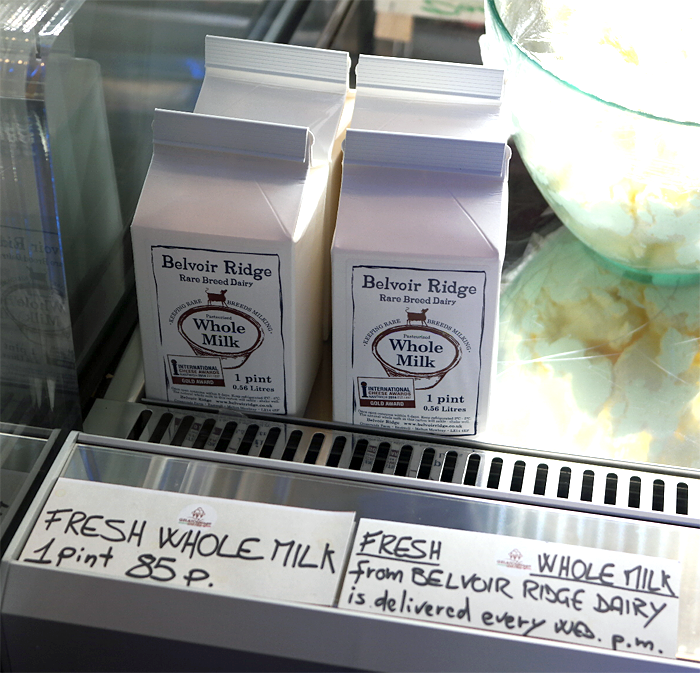 You can even buy pints of Belvoir Ridge Creamery milk at Gelato Village to take home with you, what a lovely touch! 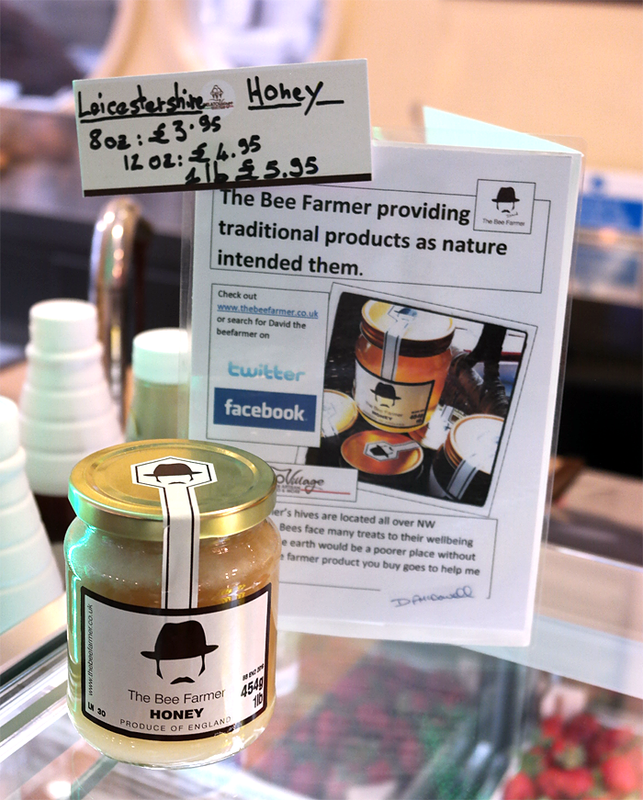 And it's not only the milk that's sourced locally - the fruit used in the gelato is bought from Leicester Market just a minute's walk from the cafe and any honey used comes from Dave The Bee Farmer who is based just 18 miles away in Ashby de la Zouch. The waffles are made fresh in house and the guys even have little brioche buns specially made at an Italian bakery a few streets away, to be cut in half and stuffed with gelato. 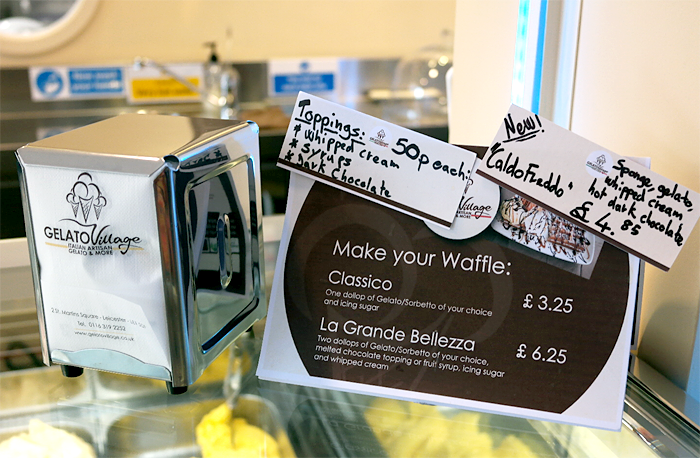 In fact only a few key things aren't locally sourced - the cones are made in Salford by a company originating from Italy while the biscuits and pastries along with the chilled counter and gelato machines themselves are made in Italy. I really love how passionate Antonio and Daniele are about using local produce, showing that with quality products they can make gelato just as delicious as they have back home in Turin! 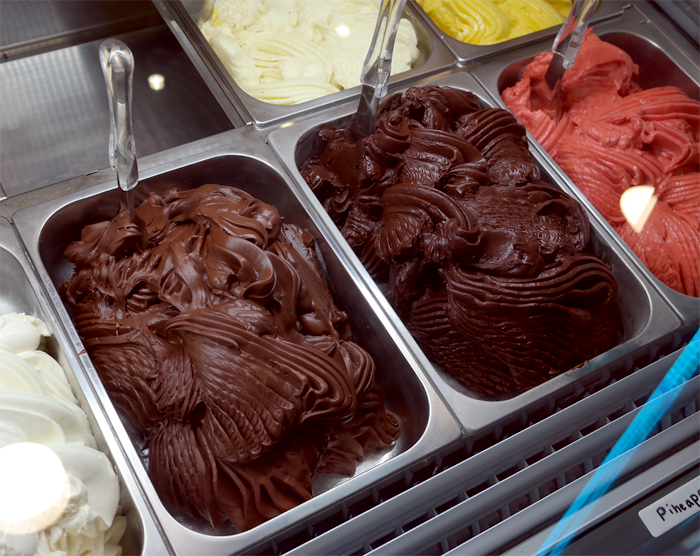 Did you know that in the USA the difference between gelato and ice cream is defined by law? It turns out that there is a lot more differences between the two creamy treats than I thought! You'll often hear people comment that gelato tastes much creamier than ice cream and I agree, but gelato actually has less fat content than ice cream! Your typical ice cream has 10-14% fat content while gelato has between 4-10% so you can definitely say that gelato is the less sinful of the two! The indulgent taste and texture occurs because there is less air in the gelato, meaning you get a denser and much creamier product with less ice crystals giving it that silky mouth feel. Gelato is also slightly less cold than ice cream which allows your taste buds to taste more of the flavour profiles, so you get a much more satisfying and delicious mouthful! 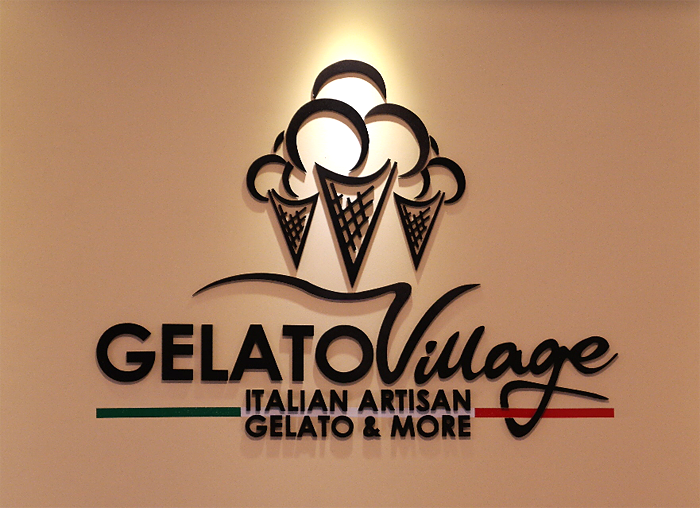 Another great thing about Gelato Village is that their recipes are all 100% natural, including the stabilisers which makes them pretty unique - they use carob bean gum rather than a nasty artificial stabiliser, often which use animal proteins. This use of only natural ingredients means that there gelato and sorbetto (just like any natural thing such as fruit) will deteriorate and break down - in this case the gelato will slowly start to sink within a few days as the stabiliser breaks down. This means that the team make most of the products fresh every morning, another thing which makes this little cafe so special! This one is much easier to explain! 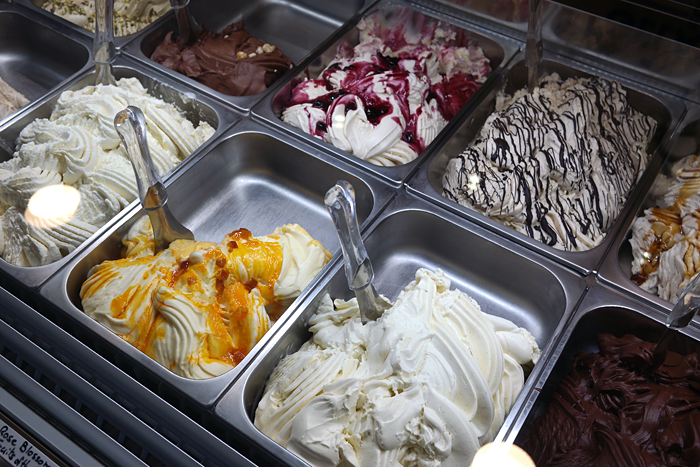 Simply put, gelato is made with milk where as sorbetto is dairy free! Which means it's suitable for my vegan bros, yay! You can see in the image above the chocolate gelato next to the chocolate sorbetto and I think you'll agree that it's obvious that the first tub is the dairy version. Both are just dreamy by the way, I think the sorbetto was my favourite as it was such a pure chocolate flavour! 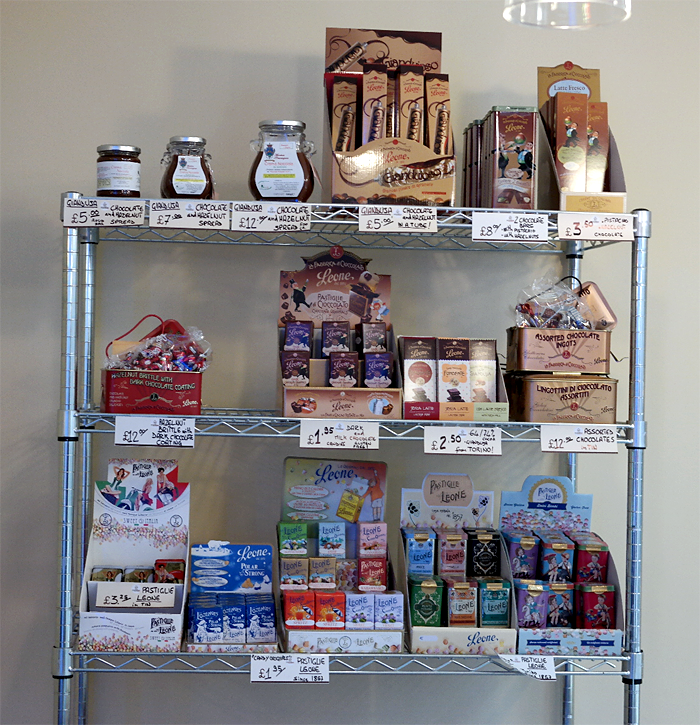 Whenever you visit you are sure to be met by an amazing array of flavours, some familiar and some less so. The team come up with these recipes themselves, inspired not only by what is in season at the time but also by their surroundings. One of my absolute favourites was the flavour they came up with for the King Richard III celebrations - English rose blossom ice cream (they steeped the petals themselves to get the flavour) swirled with beautifully sweet forest fruits. This isn't your artificial Turkish delight style rose, this is pure British blooms on a spring morning, so fragrant and delicate it isn't overpowering at all - it really is a magnificent creation. 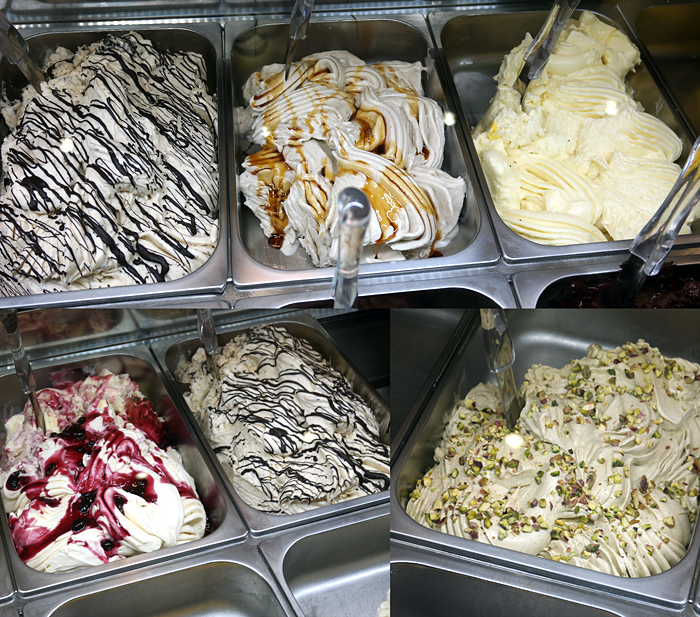 Some of there most popular flavours include the traditional stracciatella (vanilla with shreds of dark chocolate), the gianduja (chocolate and hazelnut more popularly known to us Brits as Nutella) which is a speciality of their region of Italy and the incredible pistachio gelato, made with pistachio nuts grown in the volcanic soils of Sicily. Mine and Pete's favourite however is the pure hazelnut gelato, so dreamy, creamy and decadent! My little sister is a big fan of the coconut sorbetto so I'll definitely be trying that on my next trip! If you're in Leicester anytime soon I can't recommend enough that you go and visit Gelato Village and let Antonio and Daniele's creations transport you to a beautiful Italian palazzo on a hot Summer's day. You can find the cafe in St Martin's Square, just off Silver Street in the centre of the city. They're open from noon until 10pm Monday to Thursday or if you fancy a late night treat on a Friday or Saturday you'll find them serving from noon until 11pm!